'Bodyguard': A Two-Fisted B Picture -- from Robert Altman? This trim little B film is not a masterpiece, but it's more diverting than the average B crime noir of its era. 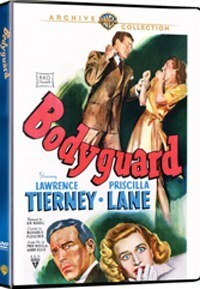 Bodyguard is a trim little B film that's an unpolished gem of late-'40s noir, an early film for well-known crime director Richard Fleischer, a showcase for big granite-faced tough guy Lawrence Tierney -- and a Robert Altman movie? Bodyguard is a movie destined to be overrated or underrated. It will be underrated by those who seek it out because of its sterling credentials in writing, directing, and acting--only to find that it doesn't measure up to better films by the same people. It will be overrated by those who, expecting nothing and used to a long line of forgettable B's, stumble suddenly upon a movie of wit, verve, and a certain visual imagination. Its accomplishments are modest yet genuine. Every scene in the one-hour running time works more or less well, and most of the characters are given snappy dialogue to chisel themselves into our attention for a standard runaround plot. It begins with two-fisted cop Mike Carter (Tierney) called on the carpet by his boss for charging into some dive without a warrant and queering a raid by the vice squad. He's being fired over it, and the tension mounts as each line of dialogue is presented in alternate close-ups, with each man staring right into the camera and looming ever larger in our faces, until the inevitable blows. It's a literally punchy way to direct what might be a simple bit of plot mechanics, and it effectively does many things. It sets up the characters of Mike and his girlfriend Doris (Priscilla Lane), who works at the precinct. It establishes that Mike is now on his own, and why he always will be. Finally, it plants a clue that we don't yet realize (because it falls outside the pattern of such conventions) is crucial to the plot that follows. While Mike hangs out with a gang of Latino equivalents to the Dead End Kids, he's courted by a mysterious stranger (Phillip Reed) into investigating threats against a mouthy old lady (Elisabeth Risdon) who owns meat-packing plants. This wealthy sourpuss is surrounded by shady, glowering, fast-talkers. In one favorite exchange, Mike asks a woman, "Just how long have you worked for this outfit?" She answers, "Long enough so that I don't have to answer stupid questions at four o'clock in the morning." As she walks away, he calls "I'll miss you." Standard though the plot may be, there's something unusual or stylish in every scene--those pachucos, a rude blonde in an arcade, an old salt with model boats, a boy in a trailer, a surprising moment of excitement and shock that drops in out of the blue and is immediately gone, leaving a new plot twist in its wake. We tour through various levels of class and get a dollop on police corruption while we're at it, all smoothly and without fanfare. These incidental details rush by and risk being forgotten, but they add up to the film's sense of itself beyond its simple formula. Visually, there's a neat bit of business involving a bullet in a mirror, and a literally dazzling setpiece in an optometrist's office that involves duelling occular close-ups and orbed reflections while we hear virtually disconnected dialogue. Credit director Fleischer, who was at the beginning of a long career. His later RKO noirs are rather better (including The Clay Pigeon and The Narrow Margin), which is one reason this film comes up short in comparison. Again, though, this film's virtues are enough to carry the day on their own. The photography by Robert De Grasse includes much Los Angeles location shooting. Lane is excellent as a gal Friday who's smarter and more resourceful than the average distressed damsel. She pays her own way through most of the running time, using a distinctively of-its-time method of research and communication with her on-the-lam boyfriend (an arcade scene with record-them-yourself phonographs) and really using her nut in the optometrist scene. Although she's ultimately obliged to be distressed in the climactic scene at the meat plant, she at least keeps her head there, too. This was her last film in a career that included Arsenic and Old Lace and Alfred Hitchcock's Saboteur. Some commenters on IMDB speculate or insist that this version is truncated from a slightly longer "director's cut". I'm not aware of evidence for this. I think people are disappointed that the final fight promises more than it delivers, but nothing seems missing. In his first Hollywood credit, Altman is listed for the original story along with George W. George (son of famous cartoonist Rube Goldberg! ), with whom he later worked on The James Dean Story. Nothing about this story seems to link to Altman with the possible exception of a desire to create a detailed world of incidental characters with no direct relation to the plot. The screenplay is credited to two legendary names. Fred Niblo Jr. (son of a famous director of the silent era) did a lot of tough-guy pictures set in prisons and such. Harry Essex's credits include contemporaneous RKO noirs for Anthony Mann (Desperate) and such later items as Kansas City Confidential (a classic 50s noir), the science fiction hits It Came from Outer Space and The Creature from the Black Lagoon, and his adaptation of Mike Hammer's I the Jury, which he also directed. Fleischer (son of pioneering animator Max Fleischer--everyone on this picture was the son of somebody famous) began with documentaries--even winning an Oscar in this field. His first feature was Child of Divorce (1946), an eye-opening RKO treatment of the verboten topic (as quiet tragedy) through the eyes of a self-possessed girl. It can be compared with Joseph Losey's The Boy with Green Hair as an example of a child commenting on the mores of postwar America. The opening shot is a dollhouse with a hand moving into frame, and later someone actually drops the Ibsen reference. The other kids tease the girl when they spot mommy kissing a boyfriend in the park. Later she dreams of taking mommy's place, but her Electra complex is thrown for a loop by daddy's new girlfriend. It ends with her in boarding school with a roommate in the same boat ("You'll get over it. You have to. "), as they look out the window into the future and imagine themselves as mothers. The camera is looking in at them so they are framed by the window. I describe it at length because it hasn't gotten its due, and neither has a criminally forgotten comic gem, So This Is New York, which is the missing link between the Marx Brothers and Woody Allen. All this was before Fleischer began his series of B thrillers. His superb small-town heist noir, Violent Saturday, shouldn't be overlooked although it is anyway. He became quite big with blockbusters like 20,000 Leagues Under the Sea, The Vikings and Fantastic Voyage, as well as the excellent true-crime thrillers Compulsion, The Boston Strangler and 11 Harrowhouse, amid many lesser works. In many ways, his early career in the B field is more interesting than his more expensive later projects, though the latter must have made him richer. You can see how these credits might lead one to suspect Bodyguard of being a little masterpiece. It's not, but it's more diverting than the average B crime noir of its era. If we only watch the best, we forget how mediocre were the rest. This one, to employ the meat-packing metaphor, is a cut above. It's freshly available through Warner Archives' made-on-demand website.